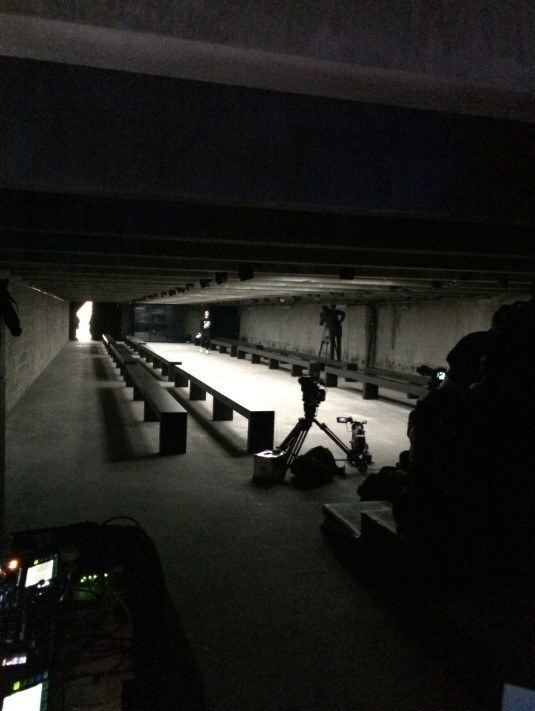 dbnAudile attended Paris Fashion Week, where we worked with our friends at Broadwick Live to provide lighting, rigging and a video surface for the Y-3 Spring-Summer 2016 catwalk show. Designed by Stephen Page, our installation used 150 LED fixtures, including SGM P5s, Prolights Studio COB CW , and our own LED tile fixtures, to light a 25m runway set in a low ceilinged, raw concrete space. An array of twelve of our i-Pix DB1 Light Valve Video Projectors provided a bold and striking alternative to a more conventional screen arrangement. Pete Robinson designed and oversaw the installation of a novel rigging system to hide the lights up between the concrete beams holding up the ceiling of the unusual, low roofed venue – further adding to the minimalist, stripped back aesthetic. For those of you who want to know what we’ll be wearing next season, click here!